Having offered great contributions to the industry until today and made Turkey the center of "wedding dresses, evening dresses and wedding suit" in the world since 2007 when it was first organized, IF Wedding Fashion İzmir 13th Wedding Dress, Wedding Suitand Evening Dress Fair has left its mark in the sector with commercial discussions of buyers from domestic and foreign markets, fashion shows exhibiting the newest wedding dresses, wedding suits and evening dresses, splendid stands, specialcollections of participating companies, workshops, fashion chats and wedding dress design competition. Preparations for IF Wedding Fashion Izmir Wedding Dress, Wedding Suit and Evening Dress Fair., which will take place between 17 - 20 November 2019 and 21 - 24 January 2020, have already started. 13th IF Wedding Fashion Izmir, which has announced the branding movement in the design for the future of sector and Izmir last year from Izmir to the world, fascinated the entire world with its quality products and designs keeping up with world fashion. In IF Wedding Fashion İzmir, where 207 local exhibitors attended from Adana, Ankara, Erzincan, Eskişehir, Gaziantep, İstanbul, Konya and mainly from Izmir, also 14 exhibitors from America, India, Hong Kong, Lebanon, Romania and Russia have opened stands. Many events held in IF Wedding Fashion Izmir as well. On the opening day of the fair, 10th International Wedding Design Competition was concluded. In the competition where there were 375 designs of the 125 designers, YaseminDikerel has been ranked the first, EceAnafarta was the second and GülşahSerin was the third.Kansu Sara, the winner of last year's competition, performed the performance fashion show "The Nightingale and the Rose". Fashion show, were followed by fashion lovers with curiosity. 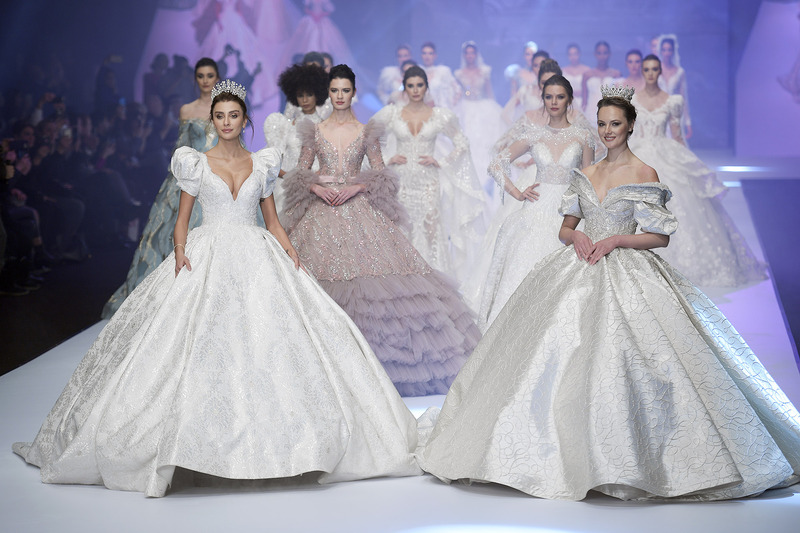 Offering a visual feast with 11 fashion shows featuring famous models, IF Wedding Fashion Izmir hosted world-famous pop singers Brianna and Kate Linn. Designers Area, which is composed of designers and companies, and the interviews in this section were carefully listened by the visitors. Russia will begin contract manufacturing in Turkey. Buyers, who have participated to the fair from Russia for the first time which such a crowded committee, paved the way for agreements which will add value to Turkey - Russia commercial relations. In the committee, which constituted representatives of the Russian Fashion Industry Association included visitors from Russia, Kazakhstan and Belarus. Ekaterina Likhacheva, who has stores in St. Petersburg and Moscow, said: "For the first time in 6 years, I came to a fair where I was satisfied. It is very nice to have wedding dress, wedding suit and evening dress together. After the fair, I'm thinking of adding a new product line to my stores in wedding suit. I like the opportunity to order for the 2019-2020 season, because looking forward is important to us." Large quantity orders will be received from store chains. Darya, Sales Manager at one of Russia's largest department stores, said, "Because we are a big company, we could not get a collection directly, because we are aiming to order in large quantities.We will have purchases which will have impact on Russia-Turkey trade figures. We liked the new collections very much. The Turkish manufacturer is always known as quality manufacturer in Russia and seems to be equivalent to Europe. Especially in the wedding dress, evening dress and wedding suit group.In the first stage, we can give a share of 20-30 percent of our production to Turkey." BlodinKaraxha, who attended the fair from a company organizing the biggest fashion show of Kosovo, said that the fair has turned into a more colorful and fun fashion feast this year, although she has attended previously as well.Stating that the fair rhythm in the fashion shows is constantly high with designers, stands, models walking in the streets of the fair Karaxha said, "You have too many opportunities to see the diversity in Turkey. We are interested in wedding dresses and evening dresses in the fashion world of Kosovo. For this reason, we mostly use Turkish products in our fashion shows.Kosovo really likes the spirit of fashion inTurkey . We can be a good partner with this fair.We'll see what we can do.I hope we can prepare a fashion show with you next year." "Design events attracted our attention"
Antonio Gannistra, a fashion consultant in Italy, said, "I have been doing this business for more than 20 years. I work with the most famous brands in the world. Nowadays, in the Italian market, we have turned to simpler and more elegant collections. We found what we were looking for at the fair. Here has become a fair where Turkey's responding to every need of the world.European collections can be further improved. We love to use Turkish products in the Italian market.Wedding suit products attracted more attention this year.As a person who likes to see fabrics on the spot, I like the opportunities offered by the fair. I touched different materials in different tissues and examined the accessories used. Although we found the 2019-2020 collections closer to the Middle East market, there were also special parts produced for us. Design-related activities also attracted our attention."